This is a twitter wordle from the last couple of years for me. I've seen some other people have their year of Facebook status updates put into a list, and I thought it would be interesting to see what my twitter feed would look like as a Wordle. 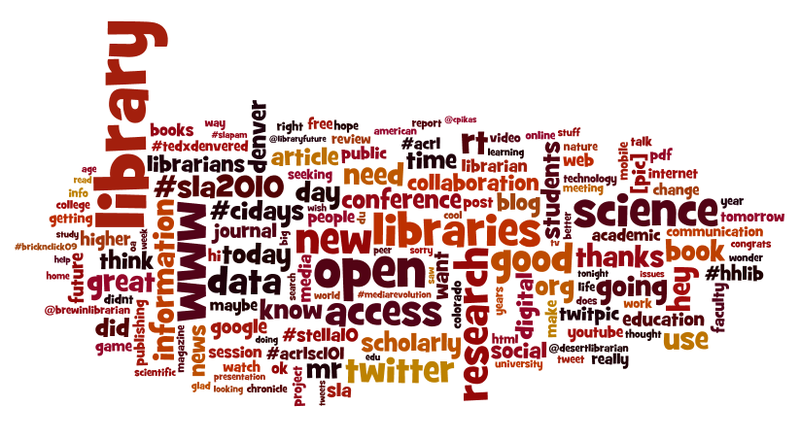 Even though this covers two years worth of tweets, I bet a wordle of just 2010 would be very similar. First, I went to tweetstats, clicked on the tweetcloud tab, then I clicked on "Don't like the TweetCloud? Well then, go make a Wordle!" To equip science and technology information professionals with the skills and knowledge they need to grow and excel in a changing information landscape. The Division functions as a community that supports the professional development of its members through communication, networking, education and research. To be the professional affiliation of choice for librarians and other information professionals who serve communities in science and technology. Please let us know what you think? Review of DIY U: Edupunks, Edupreneurs, and the etc., etc., etc. Here is the whole title of the book. Some of the book can also be found on Google Books. If the higher education system changes as much as the author thinks it will, then it will have many implications for academic libraries. Lots of people and organizations are trying to predict the future of academic libraries. The basic premise of the book is that the internet and alternative educational institutions are providing new and different ways for people to learn. She (the author, Anya Kamenetz) noted that one of the problems with the higher ed system is that students are treated differently once they transition from high school to college. If high school students are having difficulty passing classes, the teacher or the school is held responsible. If one of those students is having difficulty passing college classes, then the student is blamed. In short, some/many colleges and higher ed institutions do not take [as] much responsibility for helping their students finish their studies. There is not as much accountability for high ed institutions. She also describes a system where colleges are incentivized to increase costs and services to students. If a college costs more money, then it must be a better institution. Here is the part where I start talking about libraries. I found the word library mentioned just once in the book, and it was about the Europeana project. The word library isn't even in the index. The free Internet is OK for learning some things, but it takes an institution to provide a well stocked library of resources so students don't have to shell out money (to buy or travel to find) books and journal articles and newspaper archives and conference materials and government documents and microfilms and lots of other stuff. She also doesn't seem to get there is a much bigger and deeper web of Internet materials that are not freely available to students, unless institutions subscribe of course. It also takes an institution to provide laboratory space for students in the sciences. Doing a chemistry experiment on the computer just isn't the same thing as dealing with real chemicals in the lab. It takes an institution to provide places for students to gather for clubs and other interest groups. David Wiley of BYU (and Flat World Knowledge) shows up on page 83 and notes that "if universities can't find the will to innovate and adapt to changes in the world around them, universities will be irrelevant by 2020." (He is also a leader of the open-education movement.) People are thinking the same thing about libraries. They think we need to either innovate or we will be dead. Ummm, I don't think so. People have been saying for the last 15 years that the Internet is going to make libraries obsolete, but here we are. If anything, we are working harder than ever to help our students navigate the complex and evolving information sphere. The book covers a lot of open education and open access resources. For example, they mention DOAJ on page 85. Libraries are certainly behind initiatives like this. I did find some of her writing confusing. For example, she seemed to confuse credits with classes in some spots. This article at Inside Higher Ed does a great job of evaluating much of her logic and false assumptions. On page 88, she provided the wrong title for this article, "Minds on Fire: Open Education, the Long Tail, and Learning 2.0." The PDF is here. Instead of reading the book, this article provides a good overview of the open education movement. I did learn about a lot of new and interesting initiatives that are going on. I've known about the term "personal learning network" for a year or two. Here are some resources to get more information on that topic. "AcaWiki is like a 'Wikipedia for academic research' designed to increase the impact of scholars, students, and bloggers by enabling them to share summaries and discuss academic papers online." "Peer 2 Peer University (P2PU) is an online community of open study groups for short university-level courses." "University of the People (UoPeople) is the world’s first tuition-free online university." Hacking Education event in NYC. Overall, it was an interesting book. However, she seemed to miss the point that a lot of the education one receives at an institution is not just from taking course and reading the readings, it is from the socialization process. This is very important for younger undergraduate students, but graduate students also learn about their field by socializing with other graduate students, and from learning how their faculty mentors do research. The institution provides the "personal learning network" all in one place for the students, and they get an official certification (degree, or whatever you want to call it) of their learning. For edupunks, they might be able to build great personal learning networks and be able to learn about the topics they desire, but they may not have the same kind of certification. This may not matter as much in some fields of inquiry, but it matters quite a bit in other fields. I'd rather not go to a dentist who learned about dentistry on the open web. I'd rather not hire a lawyer who didn't have a law degree. I wouldn't trust a research article in biology, if the author didn't have a biology degree. I attended the 10th Annual Brick and Click Conference last week. It was at NW Missouri State University. One of my colleagues was not that impressed with the location for some reason. There was a dearth of Starbucks for her, I guess. We also "enjoyed" driving all the way through Nebraska. The best session I went to was by Eric Jennings and Kathryn Tvaruzka of UW-Eau Claire on "Quick and Dirty Library Promotions"
In today's economy, money for promotion of library services is at a premium. Find out how the University of Wisconsin - Eau Claire's McIntyre Library has inexpensively changed the atmosphere and has broken stereotypes typically associated with the library and librarians through library promotions and activities. The "How I met my Valentine" Contest. Secret Post community art project. "Last Call" event before classes begin. Here are some videos of "Last Call". Give away fortune cookies to students and faculty. They recommend this place as a supplier. They are not just boring pens or bookmarks. Some of the fortunes go something like: Ask a librarian for help, get an A on your paper. Or -- You will find the love of your life on the 2nd foor, it is a history book. Youth and family programs. Have a summer reading program like public libraries. Invite children in for story time. The college kids will also enjoy it when the tots walk into the library. Carrie and Sandra also had presentations, and I think they went pretty well. The best part was being able to meet and chat with online and real-life friends at the pizza place when the conference was done. It is now near the end of Open Access Week, and I want to get some thoughts down in electrons. I went to a presentation by Dr. Keith Seitter from the American Meteorological Society (AMS, not to be confused with the American Mathematical Society...), Wim van der Stelt from Springer, and Heath Joseph from SPARC/ARL speak at the UCAR facility up in Boulder on Weds the 20th. I was struck by the fact that the AMS revealed how much revenue they get from publishing their journals, and that they take in about 10% "profit" to help support some of the other activities in the society. Pretty much, the publishing is the only thing that brings in revenue, so they have to use some of that money to support those other activities. I think the amount of revenue is on the order of $8 Million, but don't quote me on that. They do have a fully OA journal, and many/most/all of their journals where they provide free backfile access. Here are their OA policies, from Sherpa Romeo. In short, they are in favor of Open Access, but they want to see a smooth and balanced transition to OA so the society can survive. Wim from Springer approached the topic of OA from a commercial standpoint. Most of what he talked about was their commercial author-pays model of OA. They own and manage the BioMed Central OA journals. I applaud them for venturing into OA, but I think they are too tied to the author-pays model. There are many other financial mechanisms for supporting OA. In the far future (maybe 10-25 years out), I see academics and scholars taking back publishing from the commercial realm. Someone will invent a system where peer-review can be done in a wiki or blog-like fashion, and in a way that displays who commented on what or who modified what. These systems exist now, but there isn't very much uptake. A lot of the scholars are slow to use these new systems because there is a great deal of inertia that makes it difficult to change course. Faculty want to publish in Nature or Science (Note: they do allow for various forms of OA, but they are not Gold OA journals.) or Whatever Journal that has the highest supposed impact. Once faculty begin to realize that they can have a greater impact by publishing in OA sources, the name of the journal will not matter as much. The names of the authors with high prestige will draw in the readers regardless of the name of the journal that the article has been published in. This will be the new academic whuffie economy. How will authors and researchers earn high whuffie scores, high prestige, high esteem from colleagues and a great reputation? They will write great articles, and share their knowledge with the most people possible through OA. They will not write articles in closed-access journals where only a few people can read them. That, and they will probably also learn to calculate their own h-index score instead of just using the impact factors of the journals they happen to publish in. Open Access Week 2010 from SPARC on Vimeo. More info about this can be found at this blog post, Momentum continues: Open Access Week 2010 begins. Here are some notes from Cameron Neylon who is in the video. While this is not really a library, the Colorado Geological Survey sells many maps and other items at their main office. Dept of Interior Libraries, such as the Bureau of Reclamation Library? We also talked about what was great about each library, but I just wanted to remember which libraries we talked about. I figure I can now go back later and investigate their websites and resources to see what they have. Finally finished Cognitive Surplus the other day. Took me a little while to read it. I had to renew it twice... I guess I was using my cognitive surplus on other things besides reading that book. People want to do something to make the world a better place. They will help when they are invited to. Access to cheap, flexible tools removes many of the barriers to trying new things. You don't need fancy computers to harness cognitive surplus; simple phones are enough.... Once you have figured out how to tap the surplus in a way that people care about, others can replicate your technique, over and over, around the world. This is what hit me with the Library Camp and Unconference model for meetings and conferences. That is why I helped to organize the STELLA Unconference. We don't always need big organizations like the ALA or SLA or State Library Associations to hold meetings of like-minded (or unlike-minded) librarians anymore. [Note: I am the Chair-Elect of the Sci-Tech Division of SLA, and I still find the SLA conference to be worthwhile.] If anything, a lot of work and discussion can get done over discussion lists and other social networking sites. The difficulty is figuring out how to tap that surplus in a way that people care about. I hope others will continue to replicate the unconference model (very low cost aspects) for other meetings and gatherings. When publication--the act of making something public--goes from being hard to being virtually effortless, people used to the old system often regard publishing by amateurs as frivolous, as if publishing was an inherently serious activity.... An activity that once seemed inherently valuable turned out to be only accidentally valuable, as a change in the economics revealed. Open Access publishing is continuing to gain steam. People are starting to realize that it does not take a behemoth to publish high quality articles. I hope that the journal I am involved with, Collaborative Librarianship, fits this description. No one wants e-mail for itself, any more than anyone wants electricity for itself; rather, we want the things that e-mail enables--news from home, pictures of the kids, discussion, arguments, flirtation, gossip, and all the mess of the human condition. Andrew Keen, author of The Cult of the Amateur, compared bloggers to monkeys. These complaints, self-interested though they were, echoed more broadly held beliefs. Shared, unmanaged effort might be fine for picnics and bowling leagues, but serious work is done for money, by people who work in proper organizations, with managers directing their work. Librarians from lots of various organizations can work together just fine without having managerial overhead. The Library Society of the World is a good example. While the LSW may experience some growing pains every once in a while, it is a working example of a group of people that can be organized without the organization. The communications tools we now have, which a mere decade ago seemed to offer an improvement to the 20th century media landscape, are now seen to be rapidly eroding it instead. A society where everyone has some kind of access to the public sphere is a different kind of society than one where citizens approach media as mere consumers. I am not quite sure I agree with his "everyone has some kind of access to the public sphere" bit. There is still quite a big problem with the information haves and have nots here in the US, and lots of people in China or Nigeria or Romania have information access problems. But, we are heading towards greater information access for all. In any case, our society is going to see great changes in the way our patrons view the media and publishing in general. The upheaval has just begun. Users never behave exactly as the designers of the system expect or want them to. As librarians, we know that this is sooooo true. Patrons never use the databases the way that the computer programmers expected. The patrons try to extract information in ways that are not expected. The patron wants to sort by the first name instead of last? The patron wants to search by the city of publication, and not just the publisher name? The patron wants to get a list of sales by longitude instead of by zipcode or some other geographic data? It is far better to start with a system that is small and good and work on making it bigger than to start with a system that is large and mediocre and working on making it better. Another truism in library systems and databases. I'd rather have patrons use a smaller clean database with good indexing and good links than a huge database that has lots of errors, comes back with strange results and leads the patron to dead ends. If you want different behavior, you have to provide different opportunities. In other words, the patrons will respond to how the database and the interface is designed. If your catalog is set up so that patrons can tag items, but only after they jump through some hoops to login to the system, then they are not going to use that feature. If a patron has to click three or four times to get to an advanced search screen, they are not going to use that, even if that is what they need to find the kinds of articles they are looking for. Twitter was created for use on mobile phones, then retooled itself for more web use..... Instead, the imperative is to learn from failure, adapt, and learn again. This section deals with adaptation. Of course libraries and librarians need to adapt, but I think we could learn from our mistakes faster and adapt a bit quicker. I work in an academic library, and some of the decisions can be made verrrrrrryyyyyyyyyy sloooooooowwwwlllllllyyyyyyyyy. Lots of decisions are made by committee, and if you don't have a consensus on something, it can be death by committee. Sometimes it can be easier to just do something based on your gut feeling and knowledge of something, and if it was the wrong decision, own up to the mistake and admit it. Sometimes, it is easier to ask for forgiveness after the fact, than it is to ask for approval from a group of people to do something before the fact. If you want some examples, let me know. As a general rule, it is more important to try something new, and work on the problems as they arise, than to figure out a way to do something new without having any problems. Some librarians can be quite risk averse. They don't want to start a new service or program without figuring out how to solve all of the possible problems ahead of time. How should we respond if someone asks a question like this? What if we get a line of people at the service point? What if the patrons want to use the equipment under water? What if patron doesn't recharge the battery? Well, I say we should just start the service and see how they use it. There is no way we are going to know how people are going to use the service or the equipment until we make it available. Biases in favor of existing systems is good, as least in periods of technological stability. When someone runs a bookstore, or a newspaper, or a tv station, it's advantageous to have those people think of their work as being critical for society. This is a section of the book where Clay is arguing that we should have as much chaos as we can stand during this media transition. We are going to see massive change in the culture of information use. Of course, librarians want libraries to exist [and thrive and prosper] because we are critical to the underpinnings of an educated populace, and to a well-oiled and smoothly running society. (Well, relatively smooth running society...) But, journalists see themselves in a similar role, and so do people who work in the telecommunications industry. When people can get news from non-journalists, or communicate with friends on Twitter or Skype or IM, then those industries are going to contract with some of the professionals in those industries crying about the lack of services that the non-professionals provide. Libraries are going to continue to see contraction because some of the funders and decision makers do not see the value of services and information we provide. We have to do a better job of marketing what we do to more of the higher ups. People committed to solving a particular problem also commit themselves to maintaining that problem in order to keep their solution viable. This has huge implications for libraries. The good news is that as the information universe continues to get more complex, we are going to continue to have patrons who need our help in navigating that universe. As new information gets published, we will have to continue to purchase or lease or subscribe to it. We need to keep track of the electronic resources and books we have, and we also have to let our patrons know about all of that stuff and all of the services we provide to our patrons. But, do we have to worry about doing too good of a job? Can we ever teach them so well, that they will no longer need to ask us how to use information products? Could a search engine do such a good job that it can do a true reference interview? I think computer software will get better, particularly with the semantic web, but I don't think it will be able to have a conversation with the patron. If someone knows what they are looking for, they might be able to get a good answer. What about the patron that needs advice on how to narrow it down? Can a computer respond with--have you tried looking at this problem in a completely different way? The computer might be able to recommend other search terms, but it won't be able to see the facial expression of the students when they are confused or happy, and know how to ask that next question. Well, that is it for me. Did you read the book? What the heck is Cyberinfrastructure? Go to these three websites for more information. NSF Report, "Cyberinfrastructure Vision for 21st Century Discovery"
I used the Twitter hashtag #cidays to mark some of my notes and comments from most of the sessions. (The conference took place last Friday, August 13th.) It was interesting to see that the comment that lead to the most feedback outside of the room was that the PLoS model is /not/ the correct one. What do you think? Will author supported OA fees ever go the way of the buggy whip? Here are some of my notes from yesterday's session. Ask vendors to sponsor something that involves not just money. The Government Information Division website has a newsfeed that is sponsored by Lexis Nexis. A publisher (AMS) helps The DPAM division print a member directory. Vendors could provide a speaker for an event, but there are political issues to work out with this. Don't give out tax advice to the Vendors. Recommend that they talk to their lawyers and accountants to make sure they can write-off an in-kind donation. If they can get a tax break, provide the SLA Tax ID number to them. They might be able to get a tax break on their business travel expenses. Get donations from companies who are not in the library or information field. A coffee place could donate gift certificates to be given away at a meeting. A gift basket could be given away. The people attending the WebEx do not recommend a raffle for legal reasons. Create a "Top 10 list of reason" why a vendor should sponsor your division or chapter. Create a spreadsheet that documents who in the division or chapter has good relationships with what vendors. Do your homework on the needs and interests of the vendors, and the people who work for them. They are people, just like you. What is their budget cycle like? The Xtreme Reference Conference was mentioned. Offer various levels of sponsorship. Be creative with the naming of the levels, not just Gold, Silver, Bronze. Vendors want to participate in conversations about products and services. They don't want to simply have a logo slapped up onto a website somewhere. Keep talking to the sponsoring vendors after the event is done. Smaller vendors could consider cheaper table top booths at the SLA conference. Sometimes, smaller vendors might be willing to sponsor something big, since they are looking for a way to get more name recognition. What should the division/chapter do if the vendor doesn't send a check? There are a variety of methods one could use to communicate your needs and the ramifications for not cooperating. After the fact -- Tell vendors the things that were written on the evaluation forms for their sessions. Ask the vendors what they thought were the positives and negatives of the session. Ask them what they would like to see in the future. Ethics. When you ask for a donation from the vendor, you are a representative of SLA, not of your place of employment. Give the vendor an SLA or a non-work related business card. SLA has business card templates. Provide SLA business cards to the leadership of the unit. Other advice on fundraising can be found in this PDF document. The WebEx session was sponsored by the IEEE. Got in to work a little before 9:00am. 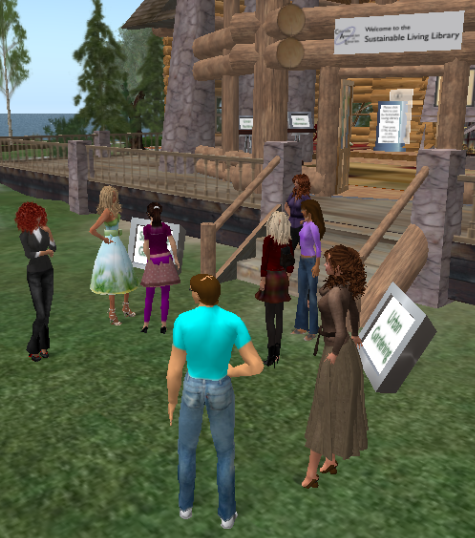 Normally, I would open up my email first thing in the morning, but today, CAL was holding a training session for SecondLife. We met at the Sustainable Living Library. Even though I am not a member of CAL, they attendees welcomed me to the session. I used to use SecondLife when I first discovered it about three years ago, but I haven't used it lately. I also knew that they changed their interface, so I wanted to put it through its paces. The new interface is ok, but I was experiencing some severe time lag issues. Once I teleported to a different island, then my performance got better. In any case, I had a good time chatting with several other Colorado librarians. Once I was done with that, then I got my chance to look over the email that accumulated over the weekend. I had 27 messages in my main inbox, 69 items had gathered in various filter folders based on certain topics or projects. I also had 25 that were listed in the junk folder. One of the items in a filtered folder was from the Library Journal Academic Newswire. There was an article about a new JISC report concerning Generation Y researchers. I found it interesting, so I put it into my delicious account. That reminded me that I wanted to put in something else into delicious. One of my colleagues wrote an article concerning collaborative collection development. At the end of the day, I ended up tagging 5 things. I have some saved searches in Google Scholar. One is for "Information Seeking" and the other covers the topic of collaboration and libraries. I usually get about 3-5 items on both topics every couple of days. I was going to blog about a new article concerning collaboration in libraries (for Collaborative Librarianship News), but then I saw that the article actually came out about 12 years ago -- not exactly new news. I sent an email to a discussion list for LIS students at the University of Denver concerning #LibDay5. I hope some of them will be able to use some of the insights from the various librarians participating in this project. I also responded to emails concerning Morgan & Claypool and an article in an obscure chemistry journal. I was at the Research Desk (formerly called the Reference Desk) from 1-3pm today. Normally, we have graduate students work the desk during the summer, but we needed to have some time slots filled, and I was happy to cover for a couple of hours. Our collection of foreign films and DVDs. During down times at the desk, I continued a discussion concerning social media and social networking tools with Walt Crawford, so I read up on his blog, Cites and Insights to get the inside scoop on his opinion. I became of friend of Gulliver the Turtle -- he is the mascot for the Open Access publisher BioMedCentral. I also read other documents to get ready for an SLA Sci-Tech Division Leadership Webinar meeting the following day. Once I got home from work, then we finished painting Mr. 10's bedroom. The weekend project turned into three days worth of work, but the room looks pretty good. I have also been wanting to try to load Linux on an old laptop (Over 7 years old) that we have, but Ubuntu isn't working out for me. It isn't loading from the flash drive, even though I changed the BIOS settings. I also tried to install with a CD-ROM, but it was taking way too long. I will give Puppy Linux a try the following day. I have read some reviews that it works very well on old machines with small amounts of RAM. The laptop has 512MB, so that should be more than enough. I will let you all know how that works out. Wish I could have gone to this conference (SCI 8: July 14-16, 2010, Experimental Approaches to New-Model Scholarly Communication) sponsored by the University of Virginia's Scholarly Communication Institute. The program and the speaker and participant list is impressive. I will be following along their tweets. If you follow me on Twitter, you were probably a little annoyed by all of my tweets with the hashtag of #tedxdenvered. Sorry about that. Now that the TEDxDenverEd conference is done, I've had some time to sit back and reflect on the talks. As an academic librarian at a medium sized private university, it was really interesting to see how teachers (particularly those with a technology bent, since many are here for the ISTE conference) are trying to figure out the best ways to reach K-12 students these days. One of my favorite talks was from Brian Crosby. I really like the way he inspires his students to ask questions, particularly in scientific areas. The High Hopes Balloon project and launch videos were amazing. He also gets his students to write about and to think about things from different perspectives. More information is on his blog, Learning is Messy. Here are the links to his students' work. I somewhat agree with Darren Wilson when he noted that "there was an obvious trend with a political and social agenda." Yes, that agenda was certainly there. But, I think teachers can more easily use topics such as environmentalism, green resources, or whatnot to get kids to be more active and involved in their education. The teacher should find out what the kids are truly interested in. If a kid is interested in making and selling widgets, then that motivation could be used as the basis for exploration into economics, business, ethics, and more. If a kid is interested in renewable energy resources, then the teacher could delve into energy exploration, land use studies, solar energy technology, and lots more. What came first, the chicken or the egg? Are students interested in environmentalism or social justice topics because that is what they are worried about, or are the teachers simply doing a great job at getting the students interested in those "political and social agendas"? I did hear the "library" word only once. (Maybe it was said more often, but I didn't hear it...) Either Pandora Thomas or Zakiya Harris mentioned the library in their talk. One of them said that students are simply not going to the library, nor are they using very many print books and newspapers, but, students do get their information from television and the Internet. Hummm, maybe their students are using library resources over the Internet, and they don't even know it? It was also cool to have Adora Svitak be a surprise co-host for the night. (Here is her talk at the main TED conference way back in April.) She was on Channel 2's News Monday morning, so I had the feeling that she was going to be involved with the TEDx event here in Denver. One of my new Twitter buddies noted that the videos will be posted to YouTube in the next couple of weeks. The next set of Denver area TEDx Conferences are Boulder (August 7, 2010) and MileHigh (Spring of 2011). I know it has been some time since I have gotten back from New Orleans and the 2010 SLA Conference, but it is the end of the month, and I thought I would write out a report about the conference. One of my main duties as chair elect of the Sci-Tech Division was to continue DST program planning for the 2011 conference in Philadelphia. I worked with a lot of other great people and divisions to layout the schedule and topics for next year. For the rest of the conference, I was able to attend many great sessions, and I was able to send out many tweets from those sessions. I also blogged about one of the sessions at Collaborative Librarianship News. One of my favorite sessions was from from Scott Brown and Kim Dority. Academic Division Roundtable session where we discussed marketing and outreach aspects of librarianship. "Future of Science Librarianship," Contributed Papers. Figured it was about time that I got an image for the header of this blog, too. Got it from http://www.flickr.com/photos/aricee/16968156/ with a CC license, shareable and remixable. Thanks to AriCee. This is a great article in the Guardian. "In spite of all the answers the internet has given us, its full potential to transform our lives remains the great unknown. Here are the nine key steps to understanding the most powerful tool of our age – and where it's taking us." I think that we are just at the cusp of the information age. Wait another 1,000, 10,000 years or 65,000,000 years, and you will see what I mean. Thanks to Hutch for the link. This is just preliminary, and it includes a lot of things that I probably won't go to. But, many of these sessions looked interesting. Some I have to attend. I will also be tweeting a lot of the sessions with #sla2010. Philly unit planners and planning committee will discuss and start planning the 2011 Annual Conference. Don't know if I can make it this year. Advance RSVP required to Khue Duong at kduong@csulb.edu. Liborio’s (www.liboriocuban.com) is within walking distance of the hotel/convention center area. Stay tuned to PAMnet for details about reservations, prices, and a meet-up spot for those who want to walk together. The LDI will introduce SLA's leaders to appropriate roles and responsibilities and offer practical guidance for fulfilling responsibilities. If you are a chapter or division officer, chapter president or president-elect, division chair or chair-elect, or caucus convener, you should plan to attend. The president-elect and director candidates for the 2011 SLA Board of Directors will be on hand to participate in a moderated panel discussion. Everyone interested in learning more about leadership in SLA is invited to attend. Continental networking breakfast at 7:30 a.m.; program starts at 8:00 a.m.
We've moved the Newcomers Lunch to Lucy's Retired Surfers Bar & Restaurant, at 701 Tchoupitoulas Street in New Orleans. The Science-Technology Division welcomes new members over lunch to learn about how to get involved in the division, network and get psyched for a great conference experience. This event is by invitation only; see Sci-Tech Division Chair of Membership Committee for details. All PAM executive and advisory board members are asked to attend; all PAM members are welcome. The Science-Technology Division Executive Board and Advisory Council will meet for our second meeting of the year. All unit members are welcome to attend. Distribute certificates to the ST division sponsors with Carol. In this joint presentation, Washington's best-loved couple, James Carville and Mary Matalin, give audiences an enlightening and entertaining look at today's most important political issues as well as a behind-the-scenes view of Washington politics. Carville and Matalin combine their unique experience as political insiders to provide audiences with a stimulating, candid and provocative analysis of the day's headlines and hot-button political issues. You won’t want to miss this lively and engaging exchange of views from both sides of the political aisle. Publishers and Liaisons involved in the PAM Liaison Program meet to discuss topics of interest. Open to other interested PAM members as well. Location TBA. All conference attendees are invited to a night of celebration. Join us for a spectacular evening of food, drink and networking at the Mardi Gras World and Grand Oaks Mansion. Enjoy a great opportunity to peek under the veiled curtain of CARNIVAL! after hours. Help celebrate SLA award winners in this festive environment. NOTE: Shuttle buses will be available to take you from the Convention Center to Mardi Gras World after the Opening General Session. The shuttles will return to the Sheraton and Marriott New Orleans (SLA HQ Hotels) starting at 9:00 p.m. and running until the end of the event. Taxis will be available for those wanting to attend other events. Join the Academic Division in meeting, greeting and dancing to a local DJ! Catch up with old friends, and make some new ones as the conference begins. Will the real Bob Smith please rise? Finding the work of a particular author is not simply a matter of matching the characters in that person's name—it also involves distinguishing that author from others with the same name and locating works the author wrote under different names. Several vendors will discuss the approaches they have used to identify authors and what they see for the future of author identification. As of this writing, Jessica Kowalski from Elsevier / Scopus, Ann Kushmerick from Thomson Reuters (ISI), Glenn Patton from OCLC, and Norman Richert from Mathematical Reviews have agreed to participate in this session. This year in 101, get an overview of national security and GIS/remote sensing and see how they fit into the life of an engineer or scientist. Our experts then introduce the best resources to help in discovering, obtaining, and working with these types of materials. These sessions will be centered around the Unconference idea. Topics for some sessions will be determined in advance and posted on the SLA Wiki at wiki.sla.org/display/unfonf/Welcome+to+our+UnConference+Wiki. Other sessions will focus on whatever topics participants want to discuss. Pre-registration is not required, but the sessions are limited to 75 people. Curious about why you should use social media tools to promote and develop your personal and professional brand? This session will describe the info pro's evolving role in the work environment. Being an employee within an organization may be a thing of the past, as more info pros shift from traditional employment to managing their own consulting practices. This requires a different set of skills, competencies and expectations of "work.” As new technologies emerge, you can use them to market your expertise, monitor and track trends, and enhance information and knowledge services. Join us as we explore assessment tools and strategies to demonstrate the use and value of library collections through best practices for collection metrics. Be a part of history by attending the inaugural session of this event! The 2010 class of SLA Rising Stars and SLA Fellows will share their collective insights into today’s hot topics in the information profession. Learn how these leading info pros are dealing with changes brought on by the digital data deluge—and of course, by the economy! Do these issues look different from the perspective of someone just making his or her mark on the profession? Come and find out as Webb Shaw of J. J. Keller moderates the first-ever SLA Rising Stars/Fellows Roundtable. Reading the Technology Future: Extending the presidential theme of ‘Creating the Future,’ this lively and provocative session examines the issue of users who have more control over their consumption of digital information and why the enterprise is so late? Greg Merkle will discuss social tools, next generation technologies and standards that are shaping the information economy. These sessions will be centered around the Unconference idea. Topics for some sessions will be determined in advance and posted on the SLA Wiki at wiki.sla.org/display/unconf/Welcome+to+our+UnConference+Wiki. Other sessions will focus on whatever topics participants want to discuss. Pre-registration is not required, but the sessions are limited to 75 people. The PAM suite will be available to PAM members to check e-mail, network with friends, and relax. Snacks and refreshments will be available. By 2013, Gartner predicts the most common Web access devices will be “mobile”. With ‘smart’ phones and emerging ‘tablet’ devices, people change the way they interact with information and communities. In this talk, we’ll outline major trends, evaluate possible consequences, and pinpoint ways to leverage these changes to your advantage. Stop by and meet the Division Cabinet Chair-elect candidates for the 2011 SLA Board of Directors. The Academic, Education and Science & Technology divisions are hosting a roundtable. Join us for a lively discussion of the most current topics and hottest trends in academic librarianship. In this exciting "unconference" format, attendees will form small groups led by moderators, and will discuss a specific problem, challenge, or new trend that academic librarians face. At the end of the session, the groups will come together for a general discussion. This is a great opportunity for learning, networking, and sharing your ideas about academic librarianship! A discussion about open source technology and what it means for libraries. Attendees will divide into groups to discuss “hot topics” in PAM librarianship. There will be an opportunity to switch topics during the discussion period. Topic "chairs" will summarize findings and suggestions for the larger group at the end of the session. This event has been combined with the Academic Roundtable: Join us for a lively discussion of the hottest topics and trends in academic librarianship. In this exciting "unconference" format, attendees will form small groups led by moderators and will discuss a specific problem, challenge, or trend that academic librarians are facing. At the end of the session, the groups will come together for a general discussion. This is a great opportunity to learn, network, and share your ideas about academic librarianship! What are the real-world benefits and requirements of an effective Access Preservation initiative? How will Access Preservation schemes handle new publishing models? This session explores Access Preservation from the point of view of a learned society publisher, and offers attendees the opportunity to discuss the future of Access Preservation. Topics focus on the future of science librarianship (captured in video, hosted on the DST site, published in the SciTech News): "The Future of Librarianship in Science and Tech Libraries" (Roth); "Using Drupal to Create the Pandemic Influenza Digital Archive for the Nat'l Institutes of Health" (King); "Promoting Public Access Policies—A New Role for Librarians"(Fernandez, Nariani, & Salmon); "Defining Future Roles from One Publisher's Perspective" (Hunter); "From Both Sides, Now: Librarians Team Up with Computer Scientists to Deliver Virtual Computer-Info Literacy Instruction" (Bloom); and "Science Librarianship Is an Essential Player in a Global Learning Company" (Mehl). As the principal in-house research agency of the U.S. Department of Agriculture, the Agricultural Research Service (ARS) conducts research to find new uses for agricultural commodities and by-products. Research related to biobased products includes the development of technologies leading to new and improved non-food products (including fuel, specialty chemicals, and industrial polymers) that expand markets for farm products, replace imports and petroleum-based products, and offer opportunities to meet environmental needs. This panel discussion about tenure will feature academic librarians at various stages in the tenure process. The discussion will cover what tenure is, what it does for you, and the details of the tenure process. Plenty of time will be allowed for questions, so bring your concerns to the people who know how tenure works! Welcome! The PAM Open House is a place to meet and enjoy refreshments, network, and just have fun! As a special addition to our meeting, the report from the PAM International Membership Award winner, Pavlinka Kovatcheva, will be presented. Thanks to American Physical Society for sponsoring the session and to World Scientific for sponsoring the award. Join the Science and Technology Division members for breakfast while we congratulate the winners of our 2010 awards and find out what the division is planning for 2010 and beyond. We all hear about data curation, digital curation, data preservation services, even e-science. 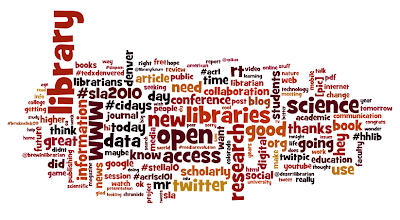 What do they mean, and how will data curation affect science librarians? Find out which skills you may already possess and which ones you may want to develop so you can participate in digital data curation efforts at your own organization. The use of social media by business professionals is growing rapidly. As a result, social media content can benefit more than just public relations professionals. Learn how you can use social media when performing business research and competitive intelligence tasks for your enterprise. Academic Division business meeting. All members are welcome to attend. Join us for a lively session on issues facing computer science. Topics will focus on Kindle/e-reader loan programs and augmented reality. Boxed lunches will be provided while supplies last! Using the format of the popular TV quiz show To Tell the Truth, this session will allow attendees to question panelists and try to determine which one is the director of the “Library of the Future.” Through their answers, the panelists will reveal what will be required for the successful library of the future. This session addresses how information professionals and information providers are using mobile devices. It will provide an overview of chemical and scientific information available for mobile devices, demonstrate specific applications, discuss users’ expectations and experiences, and forecast how access to information using mobile devices will change information vendors and libraries. Join our Internet gurus for a fast-paced, fun and fact filled hour. From the best to the bizarre and the most informative to the most entertaining, our panelists will spend just a minute explaining each particular site. By the end of the hour you will have witnessed 60 entertaining, educational, and informative sites. Thurston Miller will discuss his academic genealogy project and how he succeeded in tracing the intellectual heritage of Notre Dame’s physics faculty back through their dissertation advisors. Next representatives from several prominent physics publishers (AIP, APS, IOP, and INSPEC) will present their perspectives on the top trends in physics, including the growing interdisciplinary aspect. The session will conclude with an opportunity for attendees to discuss issues of interest, including embedded librarianship, arXiv for mobiles, arXiv's new funding model, downsizing, and more. Our speakers include: Dr. Ben Villalón, or "Dr. Pepper," a retired Texas Extension Specialist who will discuss the scientific properties of hot sauces and more spicy information; and a chef from Juan's Flying Burrito, a local Creole Tex-Mex restaurant, will do a salsa demonstration and tasting. This spicy session is co‐sponsored with three other science divisions. Take dessert from strolling buffet tables with colorfully attired ladies built into the center of each table. This is your last opportunity for non-conflict networking time and refreshments in the INFO-EXPO. Stay until the closing to see if you won $2,000. This is the official business meeting of SLA divisions. Division chairs and chairs-elect convene to request and receive reports, advise the board on matters of division interest, and initiate proposals for board consideration. The meeting is open to all SLA members. Enjoy refreshments and posters showcasing the work of your colleagues in the science divisions. The themes are New Strategic Alignments; Survival and Success beyond an Economic Recession; Information Literacy: User Instruction and E-Learning in the Sciences During; and Beyond an Economic Recession: New Methods, New Participants, New Tools. This is the official joint business meeting of SLA chapters and divisions. Chapter presidents and presidents-elects and division chairs and chairs-elects convene to request and receive reports, advise the board on matters of chapter and division interest, and initiate proposals for board consideration. Chapter cabinet and division cabinet chair-elect candidates will also give remarks. The meeting is open to all SLA members. This session will focus on strategies for marketing services as a grants librarian and integrating services with university/organization practices. Speakers will discuss outreach, coordination of funding opportunities, and elements of a successful grant application. Coffee and donuts will be available (while supplies last)! How do information professionals step out of their offices to become vital participants in research, project planning and data curation? Find out how to embed yourself within your organization. Our presenters (one academic librarian, one corporate librarian) will discuss the key polymer information resources that everyone should know about. This session will feature a discussion of astronomy-related topics and will include a presentation on e-science and the National Science Foundation's DataNet, an update from the Astrophysics Data System, news from the American Astronomical Association, and a report from the Sixth Library and Information Services in Astronomy (LISA) conference in Pune, India. In a lecture based on his forthcoming book, The Shallows: What the Internet is Doing to Our Brains, Nicholas Carr describes how the Internet is eroding our ability to read deeply and absorb knowledge—the skills we develop from reading books. The Shallows builds on his controversial 2008 article, “Is Google Making Us Stupid?”, which appeared in The Atlantic. Carr has made a name for himself questioning the conventional wisdom that information technology is a boon to society, and you won’t want to miss what he has to say about the impact of computers on how we glean information.